— In a large pot, combine oil, garlic, onion, carrots and celery; cook for 5 minutes on medium heat. Add beans, oregano, saffron and broth. Bring to a boil, cover, reduce to low heat and simmer for 20 minutes. — In a bowl, beat the eggs with the cornstarch and add lemon juice. Slowly whisk in one ladleful of chicken broth to warm up the eggs without cooking them. — Remove the soup from the stove and delicately incorporate the eggs mixture, stirring continuously until thick. Warm up soup on low heat. FINALE — Adjust seasoning and serve at once, garnished with diced tomatoes, chopped parsley and a drizzle of olive oil. TRICK — Warm up the soup at very low heat. 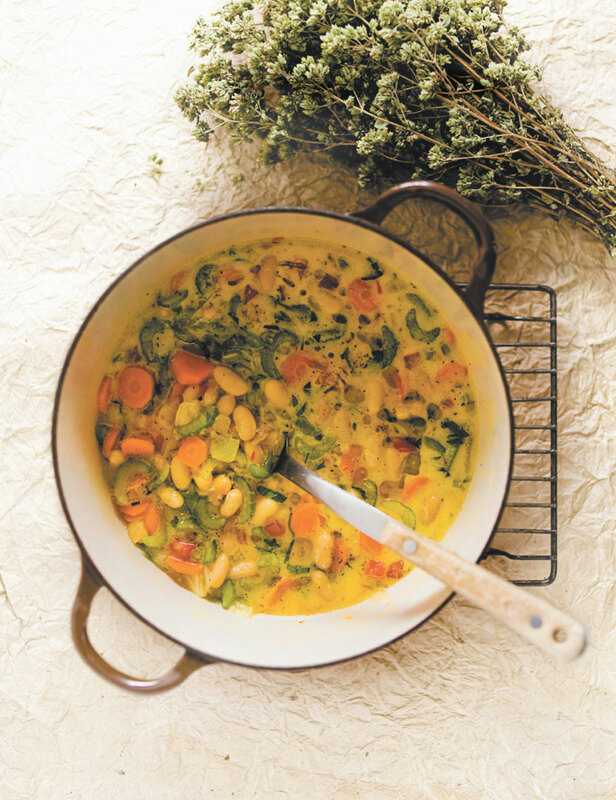 NOTE — This soup is a meal in itself, comforting and nourishing as our own Canadian pea soup.